The Early Chamber of Commerce is excited to bring EGG MY HOUSE!! This is an opportunity for families and businesses to allow us to place candy-filled eggs in your yard just in time for EASTER! We'll be delivering your orders on Saturday, April 20th at nightfall. 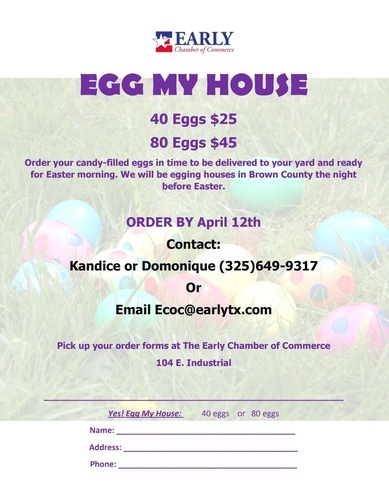 Just contact us at ecoc@earlytx.com or give us a call at 325-649-9317 to place your order today!